FOR ERIN: Such maturity beyond her years & a message for all to receive. So well written & expressed! How proud your parents & family mus be! Erin, you are a gifted writer! Your words touch me because I share your faith in our Lord. Wherever we meet, whether it is here on earth or in heaven, I want you to know that I prayed for Hunter & your family years ago & now, I am privileged to pray, once again, for your family & your dad in particular. I, too, have a brother in heaven. Like Hunter he, too, was healed in heaven & not on earth. God bless you & keep you strong Erin! Your writing is far beyond your years. I lost a husband to cancer 6 years ago and it was knowing he was in heaven and no longer suffering that keeps me going one day at a time Reading what youhhave written has been very helpful to me. 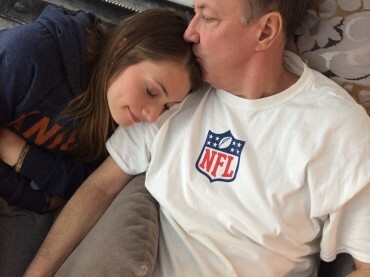 Thank you, Erin and God bless you and your dad,Mom and sister and keep you all Kelly Tough. Erin, cannot believe this comes from someone at such a young age. I have watched you mature and you are a great example of what God is doing in a life devoted to him. You brought tears to my eyes reading this. I believe they should have published this article. I want to share it with all my friends.